At about 2 a.m. Mountain Time, the Associated Press reported that Gov. 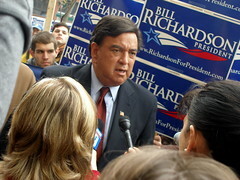 Bill Richardson will be enmdorsing Sen. Barack Obama for president. SANTA FE, N.M. (AP) — New Mexico Gov. Bill Richardson, the nation's only Hispanic governor, is endorsing Sen. Barack Obama for president, calling him a "once-in-a- lifetime leader" who can unite the nation and restore America's international leadership. I'm not sure why the weird hour. More on this later Friday. I just found this on my work e-mail. It came over at 1:50 a.m. (Don't let the "Dear Steve" fool you. It's a mass e-mail. A few minutes after it was sent, friend forwarded me a copy he got. to my campaign. We have been through a lot together and that is why I wanted to tell you that, after careful and thoughtful deliberation, I have made a decision to endorse Barack Obama for President. We are blessed to have two great American leaders and great Democrats running for President. My affection and admiration for Hillary Clinton and President Bill Clinton will never waver. It is time, however, for Democrats to stop fighting amongst ourselves and to prepare for the tough fight we will face against John McCain in the fall. The 1990's were a decade of peace and prosperity because of the competent and enlightened leadership of the Clinton administration, but it is now time for a new generation of leadership to lead America forward. Barack Obama will be a historic and a great President, who can bring us the change we so desperately need by bringing us together as a nation here at home and with our allies abroad. Earlier this week, Senator Barack Obama gave an historic speech. that addressed the issue of race with the eloquence, sincerity, and optimism we have come to expect of him. He inspired us by reminding us of the awesome potential residing in our own responsibility. He asked us to rise above our racially divided past, and to seize the opportunity to carry forward the work of many patriots of all races, who struggled and died to bring us together. troubled by the demonization of immigrants--specifically Hispanics-- by too many in this country. Hate crimes against Hispanics are rising as a direct result and now, in tough economic times, people look for scapegoats and I fear that people will continue to exploit our racial differences--and place blame on others not like them . We all know the real culprit -- the disastrous economic policies of the Bush administration! differences can we all succeed together as Americans. His words are those of a courageous, thoughtful and inspiring leader, who understands that a house divided against itself cannot stand. And, after nearly eight years of George W. Bush, we desperately need such a leader. To reverse the disastrous policies of the last seven years, rebuild our economy, address the housing and mortgage crisis, bring our troops home from Iraq and restore America's international standing, we need a President who can bring us together as a nation so we can confront our urgent challenges at home and abroad. against each other for the Presidency, and I felt a kinship with him because we both grew up between words, in a sense, living both abroad and here in America. In part because of these experiences, Barack and I share a deep sense of our nation's special responsibilities in the world. So, once again, thank you for all you have done for me and my campaign. I wanted to make sure you understood my reasons for my endorsement of Senator Obama. I know that you, no matter what your choice, will do so with the best interests of this nation, in your heart. SUPPORT KSFR -- GIVE THEM YOUR MONEY!